Facebook is once again shamelessly going after teens. The company recently launched yet another app targeted toward the demographic called Lifestage. The video-only social network, which is now available for download only via the Apple App Store, looks and works a lot like Snapchat. Want to share a video of your meal? Lifestage encourages you to take a video of it and slap a picture frame-like design on top. You can also take videos that fall into other categories such as Likes, Dislikes, Music and Books. But unlike Snapchat, you don't share the videos with friends -- instead, they visit your profile page for your latest clips, and the videos don't seem to disappear after 24 hours. Facebook (FB) is going back to its roots by permitting only a certain demographic to use the platform, too; users must under 21 to access Lifestage. However, we were able to fudge our age when signing up and were able to use it with no issue. This is the latest Snapchat-like move we've seen from Facebook (FB). Earlier in the month, the company created a new feature inside its Instagram app called Instagram Stories, nearly a clone of Snapchat Stories. Facebook also started testing a new feature in Brazil and Canada inside its main app to get people to share more videos. Whenever someone opens the app, they'll see themselves in selfie-camera mode to prompt them to upload a photo or video. Lifestage closely resembles Snapchat in many ways. To start, you'll need to upload a profile video, instead of a photo. For taking video, you have to hold the screen. And when it's time to check out friends' profiles, there's an organized list and emoticons that appear next to each name. One big difference, however, is that the platform currently doesn't support text messaging. 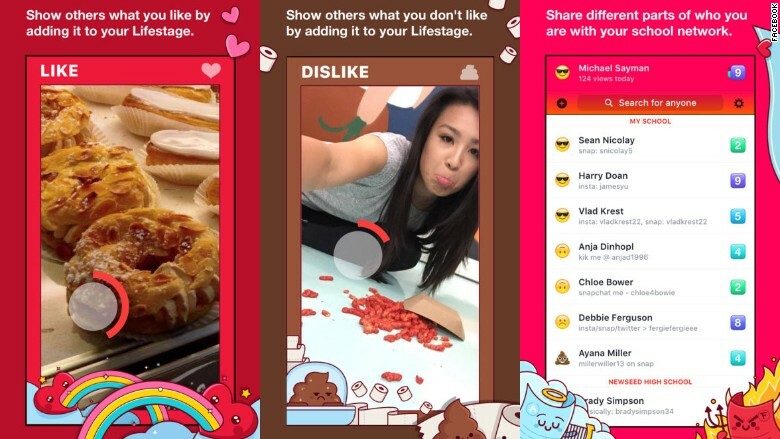 Lifestage isn't the first teen-centric app we've seen from Facebook: the company has launched and since shut down its Slingshot and Poke apps. The majority of Facebook's users are now visiting the social network via mobile devices, and advertisers pay the company more for video ads. By priming users to upload and watch more videos, Facebook is readying itself to introduce more video ads to the platform as a way to grow the business. Although Lifestage is brand new, the feedback isn't entirely positive. The app currently has a 2.5 star rating in the Apple App Store app store from 16 reviewers. Some users call it "confusing," "kinda sorta creepy" and "pointless."